Once you see Brutus, you aren’t likely to forget him. He is what you would call “one big dude,” topping out at nearly 1,900 pounds the last time he was weighed. One of the largest manatees at Blue Spring, Brutus has been a winter visitor to the park since 1970, when he was first identified. During the winter season, Brutus regularly puts in a number of appearances at Blue Spring. 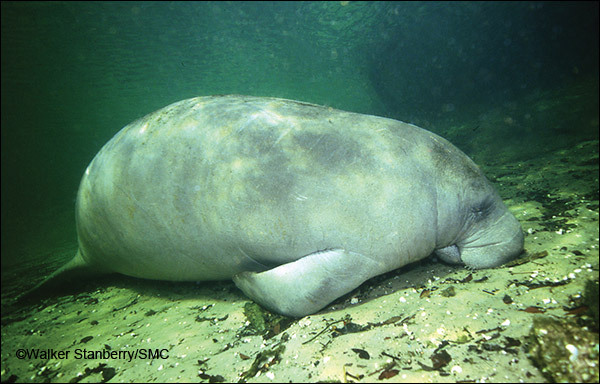 But he is sometimes late, and he is notorious for missing morning “roll call.” Brutus likes to be off on his own, snoozing late on the east side of the spring run while all the other manatees are gathered on the west side. Fortunately, Wayne Hartley, Save the Manatee Club’s Manatee Specialist, is good at spotting him, so his presence can be included in the count. 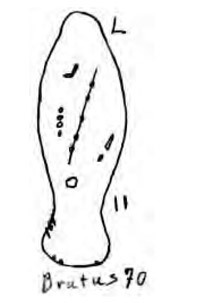 Researchers identify Brutus by his scar patterns. One of the ways Wayne is able to ID Brutus when he visits Blue Spring is by the long white scar on his back, among several smaller scars. Most adult manatees in Florida waters have scars from collisions with boats, and Brutus is no exception. Wayne has a “scar pattern chart,” and he uses it to identify individual manatees. When he is awake, Brutus is pretty social. When he arrives for the winter and departs for the spring, he is usually in the company of other manatees. He enjoys play, and often takes part in bouts of splashing and cavorting with other manatees in the spring run. Brutus seems to have a good time being where the action is and is also known for pursuing the female manatees at Blue Spring. In the last few years, Brutus has once again been asserting his independence by spending some of the winter season at a spring a few miles north of Blue Spring. He has been seen there keeping company with his buddy Merlin, another Blue Spring manatee. Luckily, Wayne receives information from other manatee biologists in the area, so he knows what the two old boys are up to. It’s been warm in Florida, and Brutus has not yet made an appearance at Blue Spring State Park, but we hope to see him soon.